NEW YORK â€“ “The Newlywed Game” is bringing on its first gay couple. It’s a celebrity duo for the long-running game show, now on the GSN cable network. 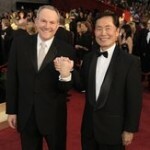 George Takei, who played Mr. Sulu on “Star Trek,” will appear with his partner, Brad Altman. They just celebrated their first anniversary after being married in Los Angeles. Takei and Altman have been together for 22 years, so they’re nothing like the giggly young couples who appeared on the first version of the show. The new edition of “The Newlywed Game” began airing on GSN a year ago and has been a ratings success. Singer Carnie Wilson has replaced Bob Eubanks as host. Posted in Odd News, Uncategorized and tagged Couple, Gay, Newlywed Game.